Natural carbon dioxide vents on the sea floor are showing scientists how carbon emissions will affect marine life. Dissolved CO2 makes water more acidic, and around the vents, researchers saw a fall in species numbers, and snails with their shells disintegrating. A weak dollar and geopolitical problems are fueling the speculative bubble in oil markets which should be trading at around half the current price of a barrel said on Monday, OPEC President Chakib Khelil. The energy ministers of the world's leading industrialised nations are meeting in Japan amid fears soaring oil prices could damage the global economy. The rising costs of energy, metals, manpower, transport, and so on, have conspired with the unfavourable foreign exchange developments of the year to make it an altogether tough time for the global seafood industry. Still, despite many sector hardships, the picture is hardly consistent. The British Government has told the United Nations that Gibraltar, --which is disputed by neighboring Spain-- should be removed from the Unite Nations list of colonies, reports the Gibraltar Chronicle. The oil price rebounded on Friday to gain over ten dollars a barrel to almost 139 while US stock prices plummeted following the report of a sharp rise in unemployment. Oil soared after Israel raised the specter of an Israeli military strike on Iran and reports that it could reach 150 US dollars a barrel by July. Japanese banks are feeling the fallout from the US subprime mortgage crisis and the credit crunch, according to the country's financial watchdog. The Spanish government on Friday authorized the extradition to the United States of a suspected Syrian weapons dealer accused of planning to supply arms to Colombian rebels, the government said in Madrid. 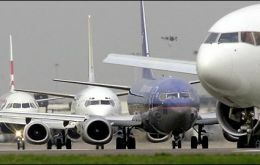 The leaders of the world's airlines unanimously agreed to a resolution calling for governments, airports and labour to take immediate action to help the industry survive the growing financial crisis. Police clashed Wednesday with hundreds of fishermen protesting against the high cost of fuel outside the headquarters of the European Union in Brussels reported BBC.